This week, I’m rerunning some popular posts while I work on the forthcoming 2017-18 Economic Report on Pharmaceutical Wholesalers and Specialty Distributors. Click here to see the original post and comments from June 2017. ICYMI, I published a corresponding per-prescription analysis in Follow the Dollar Math: How Much Do Pharmacies, Wholesalers, and PBMs Make From a Prescription? Time for my annual review of the Fortune 500 list. Every year, this is one of my most popular posts, because it helps us “follow the dollar” and understand how drug channel intermediaries make money. The 2017 list contains the same seven drug channel companies that the 2016 list did: AmerisourceBergen, Cardinal Health, CVS Health, Express Scripts, McKesson, Rite Aid, and Walgreens Boots Alliance. Using the Fortune data, I explore the profitability and shareholder returns of the largest public drug wholesalers, chain pharmacies, and pharmacy benefit managers (PBMs). I compare these companies with the Fortune 500’s ten pharmaceutical manufacturers and a separate survey of independent pharmacies. The Fortune data remind us that many multi-billion dollar businesses profit as drugs move through the U.S. reimbursement and distribution system. We must recognize this complex system in order to tackle the price and affordability of drugs. 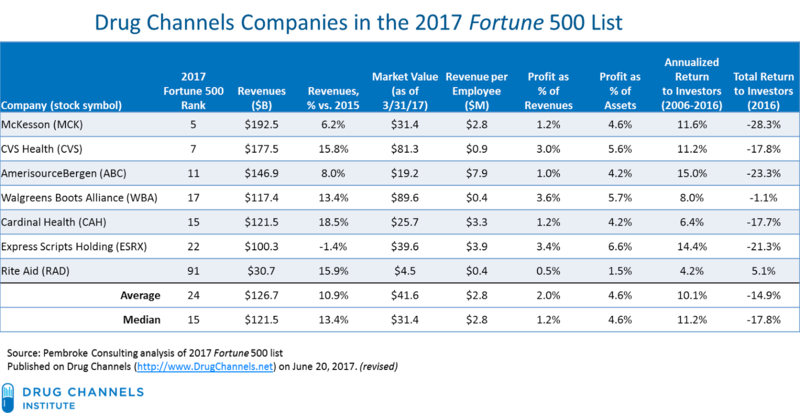 Here's our exclusive Drug Channels summary of the seven drug wholesalers, drugstore chains, and PBMs on the 2017 Fortune 500 list. See the methodology comments at the end of this article for help in interpreting these data. Three additional drug channels companies appear in the broader Fortune 1000 list: Diplomat Pharmacy (#554), Fred's (#903), and Pharmerica (#914). Each of these three companies earned revenues below $5 billion. I excluded them from the analysis because of the large revenue gap compared with the seven included companies. 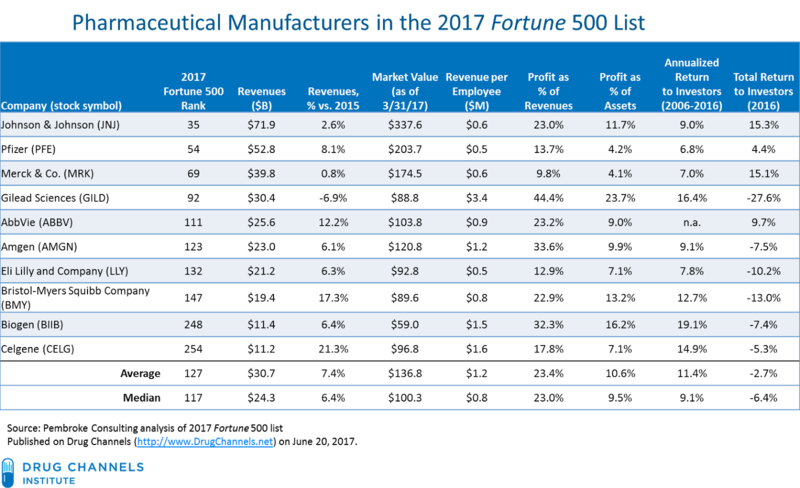 Here’s a companion table of the 10 largest pharmaceutical manufacturers on Fortune’s 2017 list. This year’s list includes AbbVie, Amgen, Biogen, Bristol-Myers Squibb Company, Celgene, Eli Lilly and Company, Gilead Sciences, Johnson & Johnson, Merck & Co., and Pfizer. OBSERVATION #1: Drug channel companies are MUCH bigger than manufacturers. 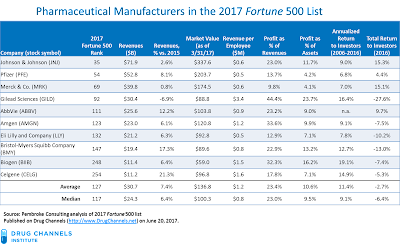 Drug channel companies have higher revenues than pharmaceutical manufacturers, so they rank higher on the Fortune 500. For 2016, average revenues for the seven drug channel companies were $126.7 billion, up 10% over the 2015 figure. Average revenues for the manufacturer group were $30.7 billion, or less than one-fourth of the drug companies' average. Six of the drug channel companies rank in the top 25 of the Fortune 500 list. By contrast, none of the manufacturers made the top 25. 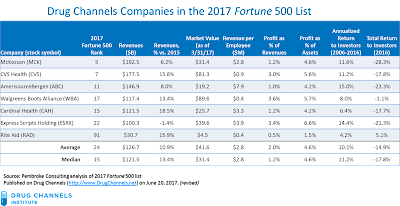 The revenues of the 10 largest pharmaceutical manufacturers on the Fortune 500 list range from $71.9 billion (J&J; #35) to $11.2 billion (Celgene; #254). Quadruple-counting of prescription revenues within the channel is the most important factor behind this disparity. 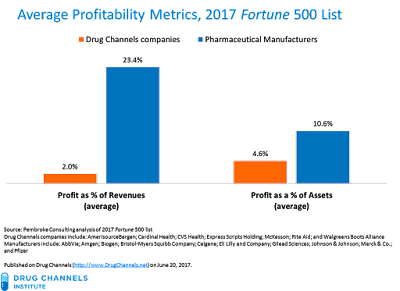 Since the Fortune 500 rankings are based on sales revenues, this system pushes channel participants to the top of the list. A manufacturer sells a pallet of a drug to a wholesaler. The manufacturer reports the net revenue from the sale on its income statement. The wholesaler sells a case of the drug to a pharmacy. The wholesaler reports the revenue from the sale on its income statement. The pharmacy dispenses a prescription for this drug to a patient. 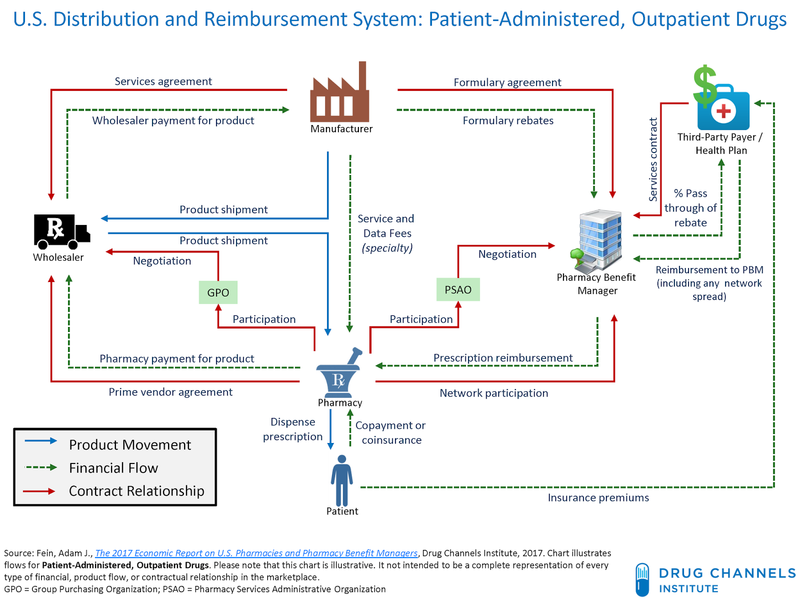 The pharmacy is reimbursed via a combination of the patient's copayment and reimbursement from a PBM. The pharmacy reports the revenue from the prescription on its income statement. There is another key distinction that many people do not consider: Manufacturers report net revenues after gross-to-net discounts and rebates to third-party payers. In 2016, these discounts and rebates totaled $127 billion, which reduced manufacturers' gross revenues. See New Data Show the Gross-to-Net Rebate Bubble Growing Even Bigger. 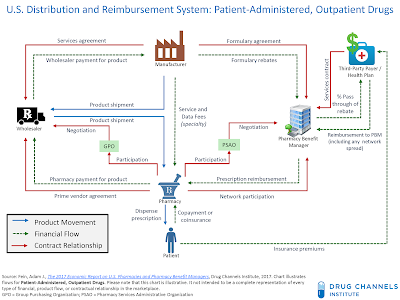 By contrast, manufacturers’ rebates to PBMs and other third-party payers do not flow through wholesale or retail channels within the U.S. distribution and reimbursement system. For brand-name drugs, revenues for wholesalers, pharmacies, and PBMs are therefore based on the Wholesale Acquisition Cost (WAC) list price, not the net selling price. I discuss the implications of this important distinction in Drug Prices, Manufacturer Rebates, and the Risk to Channel Economics. Note that I included revenue per employee computations in the analysis. As you can see, revenue per employee averaged $2.8 million at the drug channel companies, but only $1.2 million at the drug makers. OBSERVATION #2: Drug channels companies have much lower return on sales. When their profits are measured by Return on Sales (= Profit ÷ Sales), the profits of wholesalers, PBMs, and pharmacies are a small fraction of manufacturers’ profits. As you can see in the table above and chart below, Return on Sales (ROS) was in the low single digits for all companies in this group, regardless of their position in the channel (pharmacy, wholesaler, or PBM). In 2016, the average ROS for the drug channel group was 2.0%. In 2016, the drug manufacturers’ average profit as a percentage of revenues was more than 10 times as large, at 23.4%. OBSERVATION #3: When measured by Return on Assets, drug channels companies’ profitability looks much better. ROS is a flawed measure of profitability for channel intermediaries due to the revenue double-counting. A more meaningful metric is Profits as a % of Assets, a.k.a., Return on Assets (ROA). When profits are measured by ROA, channel company profitability is much closer to that of pharmaceutical manufacturers. ROA relates ROS to the balance sheet assets required to generate an income statement profit. The biggest part of a drug channel company's balance sheet is current assets (cash, product inventory, or accounts receivable). For example, the value of product inventories, accounts receivables, and cash accounted for more than 90% of the big three wholesalers’ current assets. (See Exhibit 60 of our 2016-17 Economic Report on Pharmaceutical Wholesalers and Specialty Distributors.) In contrast, the biggest assets of a pharmaceutical manufacturer tend to be long-term, such as intangible assets, goodwill, and physical plant, property, and equipment. The profitability of companies in the drug channels universe looks much more attractive this way. In 2016, the group average was 4.6%. The ROA figures for drug channel companies now look closer to those of the pharmaceutical manufacturers, whose average profit as a percentage of assets was 10.6% in 2016. The manufacturer-to-channel ratio was slightly more than 2X for ROA. The chart below summarizes the average profit metrics. The difference reflects partly the innovation/risk premium associated with the expensive, risky, and time-consuming business of drug discovery. Pharmacies, wholesalers, and PBMs wouldn’t exist unless manufacturers created valuable and innovative drugs. To measure the relative profitability of channel members, I like to compare gross profits with operating expenses. Gross profit reflects the value added by an intermediary in the distribution and reimbursement system. The ratio of gross profit to operating profits shows how effectively a channel intermediary converts gross profits from distribution into operating profits. Alas, the Fortune lack the data to compute this non-GAAP metric. OBSERVATION #4: Independent pharmacies’ profitability is comparable to that of the largest public drug channel companies. A little algebra plus some educated guesswork implies that average Return on Sales was 2.7% for independent pharmacies. Private pharmacies don't always manage based on the same return metrics as a public company. The independent pharmacy data, however, continue to show profits comparable to or exceeding that of the public companies. OBSERVATION #5: In 2016, investors earned very poor returns both from drug channel companies and manufacturers. Both groups did much worse in 2016 than the S&P 500 index, which finished up about 10% for the year. For consistency, all data are taken from Fortune’s measurement of key financial metrics, which appear to be derived from Generally Accepted Accounting Principles (GAAP) reporting. A link to the methodology appears on the Fortune 500 main page. (Sorry, no direct link.) Note that GAAP accounting may not reflect the true underlying operating performance of a business. I include only those drug channel companies that earned a majority of their revenues from pharmaceuticals. This criterion excludes other retail formats with pharmacies (supermarkets and mass merchants). I do not separate the revenues from each company's various lines of business. The Fortune 500 list excludes companies incorporated outside the U.S. Large domestic subsidiaries drop off the list after being acquired by a foreign company. P.S. The Fortune 500 web page features an incredibly annoying autoplay video. Sorry, Fortune, but you're despicable! Note: The "Annualized Return to Investors (2006-2016)" and "Total Return to Investors (2016)" for Express Scripts were misstated in the original version of the first table.